The Reptilian Code of Toilets? I’ve recently read an interesting article on the work of cultural anthropologist Clotaire Rapaille who’s the author of different books, among them the “The Culture Code“ and “7 Secrets of Marketing in a Multi-Cultural World“ . One of this theories is that “buying decisions are strongly influenced by the reptilian brain”: only accessible via the subconscious, the reptilian brain is the home of our intrinsic instincts . According to his website, his list of clients includes General Motors, Procter & Gamble, General Electric, Boeing, IBM and AT&T. In the course of these Archetype Discoveries, as he calls this process, he helped uncovering the secret code of cities and products, such as Dubai and Singapore. Clotaire Rapaille also recently received a lot of hatred when he identified the “code” of the City of Québec in Canada as “completely neurotic” and Quebeckers having a “sadomasochist” relationship with “the English”. The inconvenience of such “truth” obviously is the risk you take while uncovering subconscious messages. 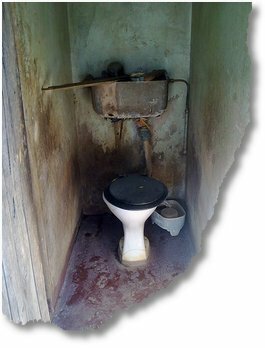 This blog is about sanitation. Sanitation, as in: clean toilets and sound treatment options. In an ideal world, all waste streams would probably be sustainable and could be reused (the biological and technical nutrients would remain in a loop). The Sustainable Sanitation Alliance (of which this blog is a partner) aims to focus on such sustainable approaches. Most humans, however, don’t seem to care about the treatment options, for them all that matters is the interface between them and the problem (their urine, faeces and other biological waste) because it is what they get in touch with. Such an interface is the toilet – a place where they can safely & comfortably urinate and defecate, with or without privacy. To my understanding, the approach of the sustainable sanitation people has in the past also included the various treatment options (which are best described in the multilingual Compendium of Sanitation in Developing Countries), so the design of new toilets often follows the attached treatment option(s). After about a hundred years of conventional flush type toilets in the developed world that are based on water for transport, the approach from the treatment side isn’t that wrong as it shifts the sanitation problem from the user side to the environmental engineering side: let someone else take care of it. This “flush and forget” mentality probably also is what made flush type toilets so popular in the past, for they allowed the convenient discharge of waste within a few seconds. Now, I understand that it would probably not be possible to have a single technology, a single toilet and treatment option for all humans out there on this planet, BUT! – and that’s where Clotaire Rapaille comes into play – would it be possible to make use of the Archetype method to identify the optimal toilet design for each culture out there? Not because toilet users in each community wouldn’t know best what they want (or rather: what they are used to), but because such an unconventional approach could probably shed some new light on toilet design – and which type would be best suited for each community (going by their intrinsic needs). Jack Sim, founder of the World Toilet Organization in Singapore, already uses a similar approach on one of his toilet hygiene education projects in some SE Asian countries: “dirty toilets cause cancer”, he argues in this video, shot at the Water Cube @ Stockholm World Water Week 2010, “all the people in China who started smoking on the toilet” (because of smelly toilets) “continue to smoke and eventually get lung cancer”. People smoking on toilets. On toilets! …because they don’t want to smell the remaining faeces of others. Oh my. While his approach also delivers another argument on why progressive people in developed countries (yeah, the RP of China) should also rethink their investments into a proper toilet, it’s interesting to see the way toilet users chose to avoid the smell problem. Instead of cleaning the toilet, they prefer to smoke. This “hygiene” strategy in my opinion says a lot about the intrinsic instincts of toilet users in those communities. People don’t want to touch or care about other faeces, others than their own (as Jack argues: “you forgive yourself for the smell if you defecate within the first 6 seconds”) and will do anything else to cover it up. You’ve probably already heard of or even used one of those sophisticated bidet/washlet toilets in modern Japan that offer so much comfort, including a sound module that covers up any embarassing sounds. I still remember squat toilets in traditional Ryokans while growing up in Japan which were very basic – but which also were very much in line with the traditional & rough Japan back in the days (1970s+80s). Nowadays, with over 13 million inhabitants in the Metropolis that Tokyo has meanwhile become, coupled with this special Japanese understanding of how an individual has to be part of a group, I understand that these modern toilets not only provide a very luxurious hygienic comfort, but also protect its users from any embarassing situation. The success of these toilet systems probably also goes in line with the use of toilet slippers, as there are clean and unclean areas, and may also be related to the ongoing ageing of society in Japan (which calls for automatic solutions). Given that about 72% of all installed toilets in Japanese households are of this bidet type, it seems obvious that toilet users / consumers are willing to invest money into such “luxury”. Is this – the luxury of a clean & modern toilet – in any way related to the intrinsic needs of toilet users in Japan? I am asking this question as the “intrinsic instincts”, as Rapaille calls them, are very Freudian in a sense that they are associated with our early childhood memories. Given that Japanese boys are often pampered until they join university, and given that they are the ones who make the buying decision in Japanese families, could this desire for a luxurious toilet be part of their intrinsic instincts? “Nonsense”, you may reply, “toilets are toilets, everyone needs to use them, Freud is totally overrated and this Rapaille dude from France a wacko”. Yes. And no, not really. Because there could indeed be a “Reptilian Code of Toilets” that still needs to be identified. “The Hot Button”, as Rapaille calls it, the unique code why consumers do something. Open defecation in a society that’s so old, sophisticated but also traditional and with a lot of 2000yrs old working in-the-loop-concepts, it seems more than logic that a lot of (poor) people are still defecating in the open (see documentary from my previous post) – simply because it’s the most practical thing to do. And that, ladies and gentleman, is a culture code. Is there any Reptílian Code on toilets?